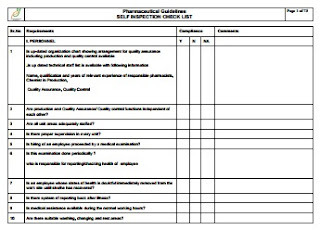 Self-inspection is carried out in pharmaceutical manufacturing facilities to check the cGMP implementation and product manufacturing process. Self inspection is basically a very useful and powerful mechanism for detecting any shortcomings or faults operating within any system. It means one needs to redeem on their own policies and check for its conformity and compliance with the appropriate corrective measures. It is a sure-shot way to evaluate the whole operating system from every aspect to ensure and maintain the quality of products. It is not limited to finding the faults and follies, and infiltrators within the system but also finding and planning ways to overcome the problems effectively. A self inspection program comprehends all the current good manufacturing practices (cGMP). This is essential to ensure the conformity of a specific system/company with the rules and regulation (cGMP guidelines) as per WHO requirement. In case of nonconformity or noncompliance, it is reported to the concerned authorities and corrective measures are taken for continuous improvement in the quality of products. This not only checks the prevailing errors within the system but provides a remedy to it by suggesting and implementing the preventive measures, in a timely manner. A self inspection team comprises self inspections and team members. Lead auditors are specifically based on their expertise in different areas as identified by QA Head (Quality Assurance Head). The Quality head selects a self inspection team, which is a cross-functional team from various departments such as Quality Assurance, Quality Control, Production Control, Engineering and Personnel & Administration Department before the start of every calendar year (last week of March). It is also ensured that lead auditors or team members in a specific self-inspection team are not from the same Auditee Department, where the self-inspection is planned. It is scheduled as twice a year but in case of any critical market compliant or product recall related to the quality issue or nonconformance with GMP guidelines, self inspection can be initiated in the respective areas/ systems before the schedule. Unscheduled inspections may be carried out at the direction of Head QA. The conclusion report includes not only the faults or shortcomings within the specific area/system but also the corrective measures that need to be taken within the provided time frame to improve and maintain the transparency and quality within the system. Good article. As per my experience the self inspection program is for name sake, to satisfy regulatory requirement. Could you please suggest what kind of measures shall be taken to make this program actual worthy.